For remarkable results in medical aesthetics! Over the years, medical aesthetics companies have invested millions of dollars to develop a noninvasive multifunctional device for permanent hair removal and skin treatment; These systems are based on laser technology that emits a short light pulse. Multifunctional FormaTK hair removal device has the ability to send the same short light pulse using a revolutionary technology. 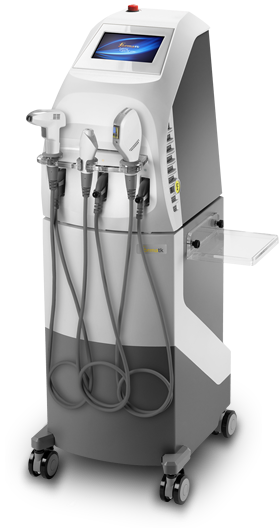 FormaTK Multifunctional device for permanent hair removal is the only aesthetic device designed to respond to large areas of medical and aesthetic applications, bringing together several technologies in a single system. FormaTK IPL hair removal uses six applicators and IP – protected technologies that allow the user to adapt the technology and method of treatment depending on the particular needs of each patient. FormaTK permanent hair removal device has been designed to deliver remarkable results by using several methods and types of energy, ensuring the safety and success of treatment. The innovative FormaTK IPL system make it self distinguished by the best quality-price ratio on the market, providing fast return on investment. Friendly User Interface, easy to use. The chosen amount of light energy (XJ / cm²) is delivered to the skin in a single strong and localized pulse. The pulse duration can have different values between 20 ms and 55 ms, and HR epilator applicators can be adjusted by the operator; for the other applicator (F-HR-HR B, M-HR *, B-HR *) pulse duration is set automatically from 2 ms to 10 ms. By using singular module, there is a noticeable performance through photothermolysis and has a precise and powerful impact on the target area. This mode is recommended for all situations in which there is a noticeable good skin tolerance and no risks related to changes in color, but also in the case of very sensitive areas like the groin. The chosen amount of light energy (XJ / cm²) is divided into two equal parts, with a range of 250 – 350ms. For example, the HR applicator for skin type III may be set to 17J / cm² to 40 ms in dual mode and has the following structure: 8.5j / cm² at 20 ms in a period of 350ms, double pulse. Although the sum of the two pulses reaches the set amount of energy (in the case of 17J / cm²), traumatic impact is significantly reduced. This is the right choice to maintain the effectiveness and reduce the sensation of pain the patient hypersensitive. Whereupon double mode reduces the risk of side effects such as redness or burning. It is recommended in sensitive areas (perianal, groin, periorbital) but can be used on any area if the patient has a high degree of pain. A small amount of energy (3,5J / cm² – 7J / cm²) is delivered continuously and rapidly (1 Hz – 3 Hz) on the skin and is the safest way of working. By using a continuous series of pulses at low intensity, the operator will get to gradually set amount of energy released in one area. This type of procedure is ideal for finishing and maintenance if definitive hair removal, as well as in situations of hypersensitivity. Two special chromed ends produce bipolar radiofrequency (RF), the resulted energy warms the treated area and stimulates collagen fibers and elastin production. One end with ultrasonic vibrations, placed in the center of the applicator, massages the treated area, thus stimulating blood circulation. This applicator is used at the end of facial rejuvenation treatment in order to restore skin vitality and freshness. Another very useful function of R-sonic applicator is mesotherapy. Reducing the radiofrequency to zero and using only Ultra-sonic vibration function, they can insert nutrients (serums, hyaluronic acid, vitamins) at skin level and in depth. It has 4 interchangeable discs coated with diamond, with different levels of roughness, which can be used for all skin types and body areas, in order to exfoliate dead cells and smoothen the skin. (disc no. 4 has a degree of roughness applicable to elbows and feet). The best results are recorded when treatment is carried out quickly and each session is followed by treatment with the applicator R-Sonic to accelerate blood circulation, thereby improving skin texture and tone skin. Mode no. 1: deep penetration, for soft tissues, e.g. cheeks. Mode no. 2: superficial penetration, for bone areas, e.g. eyebrows. Two cold ends which use bipolar multifrequency acts on skin layers of different body areas. The radiofrequency intensity has 8 levels. The treatment improves skin tone and texture. Heating denatures the collagen tissue, causing natural production of new collagen and elastin fibers. The skin becomes firmer and wrinkles are smoothed. 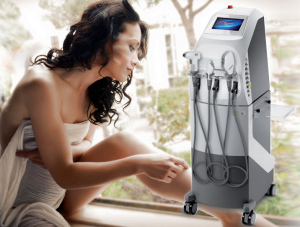 Comparing most of the equipments of other top companies, FormaTK IPL hair removal technology, distinguishes itself with the most shortest pulse duration, using high energy for maximum efficiency. Due to the short duration of the pulse, the IPL hair removal acts directly on the target (hair follicle) with maximum energy, but energy has no time to disseminate the surrounding skin tissue, thus not affecting the skin by overheating, unlike other technologies. Thermal relaxation time is the time taken cutaneous tissue to lose 50% of its heat diffusion. If persists more light energy than the thermal relaxation time, heat is conducted to the surrounding tissues and increases the risk of thermal injuries. Therefore, due to the short duration of the pulse, FormaTK technology is the most effective, safe, painless and free of side effects! Continuous mode: energy is transmitted in small, applicator lamp glides over the skin. The lamps are cold for the treatment to be agreeable. * A safety element prevents triggering light pulse if the applicator is not in contact with the skin. The treatment is painless, with no side effects, requires no recovery time and can be performed during a lunch break (10-15 minutes). The treatment combines two innovative technologies for increased efficiency in attenuation of expression wrinkles. We recommend carrying out this treatment monthly to treat and prevent wrinkles. It can be done as standalone or as a complementary treatment to Diamond Peeling treatment (diamond microdermabrasion). It features a safety mechanism that ensures that the two ends are in contact with the skin for radiofrequency release. The treatment is effective and at the same time, a real pleasure for the face and body. The treatment is painless, with no side effects, it is fast and can be performed during a lunch break. The treatment is effective,painless, fast, with no side effects and can be performed during a lunch break. It features a safety mechanism which ensures that the two ends are in contact with the skin for optimal radiofrequency release. Energy level Skin type I-II: 14.2 J/cm2 – singular/double mode;Skin type III-IV: 12.3 J/cm2 – singular/double mode; Skin type V-VI: 10.4 J/cm2 – singular/double mode; *Continous mode is available and can be used for PDT, with maximum 7J / cm². Energy Levels Skin type I-IV: 21.8 J/cm2 – 20 ms, Singular mode;Skin type V-VI: 18.0 J/cm2 – 20 ms, Singular mode. No. of treatments Isolated pigmented lesions: 2-4 treatments every 3 weeks, Rejuvenation-whitening-toning: 4-6 treatments every 7-10 days. Energy levels Skin type I-IV: 21.8 J/cm2 – Singular mode; Skin type V-VI: 18.0 J/cm2 – Singular mode. * The double and continuous mode available but not recommended. No. of treatments 2-4 treatments, once in 3 weeks. Energy level Skin type I-IV: 21.8 J/cm2 – Singular mode; Skin type V-VI: 18.0 J/cm2 – Singular mode. Energy level Skin type I-II: 13.8 J/cm2 – Singular, double and continuous mode; Skin type III-IV: 12.2 J/cm2 – Singular, double and continuous mode; Skin type IV-V: 10.0 J/cm2 – Singular, double and continuous mode; *Use Continuous mode at 650-1100nm for tanned skin and very sensitive skin. No. of treatments From 5 to 10 treatments (may vary). Time between sessions: the first session – second session: 3-4 weeks; second session – third session: 4-5 weeks interval third session – fourth session: 5-6 weeks interval. No. of treatments Around 1 or 2 exfoliation per month. No. of treatments Combining RF with ultrasonic vibrations or just applying RF: 5-10 treatments every two weeks, Ultrasonic Vibration: no limitation. Daca va intereseaza FormaTK, va rugam sa ne contactati!